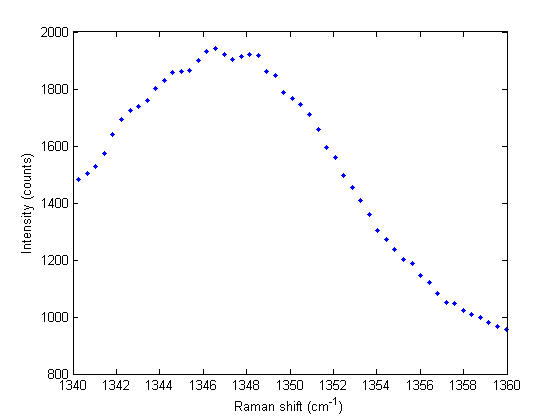 Raman spectroscopy is a vibrational spectroscopy. The data typically comes as intensity vs. wavenumber, and it is discrete. Sometimes it is necessary to identify the precise location of a peak. In this post, we will use spline smoothing to construct an interpolating function of the data, and then use fminbnd to identify peak positions. 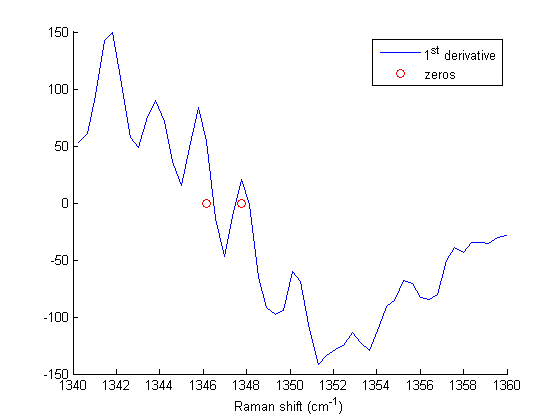 We will focus on the peaks between 1340 and 1360 cm^-1. The last parameter in csaps determines the amount of smoothing. Closer to 1.0 is less smoothing. 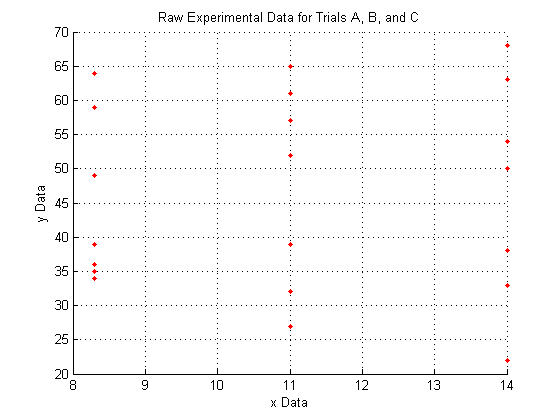 % interval around each zero. In the end, we have illustrated how to construct a spline smoothing interpolation function and to find maxima in the function, including generating some initial guesses. There is more art to this than you might like, since you have to judge how much smoothing is enough or too much. With too much, you may smooth peaks out. 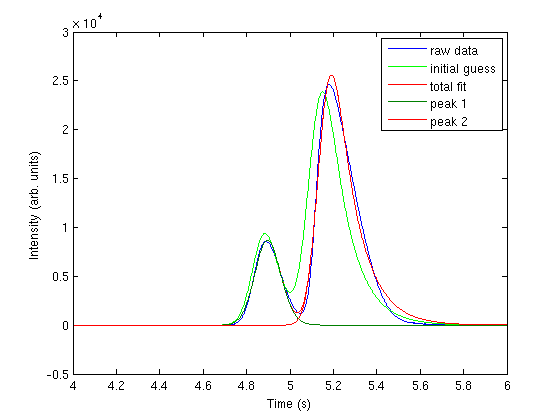 With too little, noise may be mistaken for peaks. Today we examine an approach to fitting curves to overlapping peaks to deconvolute them so we can estimate the area under each curve. You will need to download gc-data-2.txt for this example. 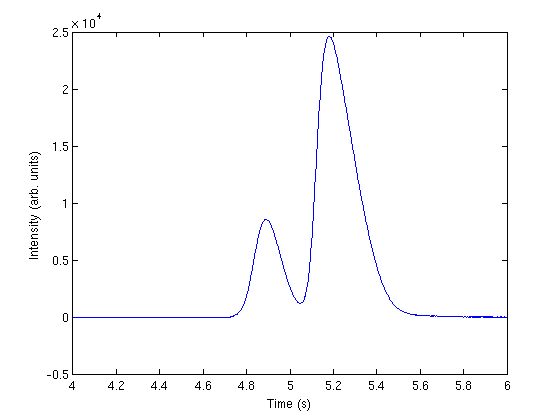 This file contains data from a gas chromatograph with two peaks that overlap. We want the area under each peak to estimate the gas composition. You will see how to read the text file in, parse it to get the data for plotting and analysis, and then how to fit it. The data file is all text, and we have to read it in, and find lines that match certain patterns to identify the regions that are data, then we read in the data lines. 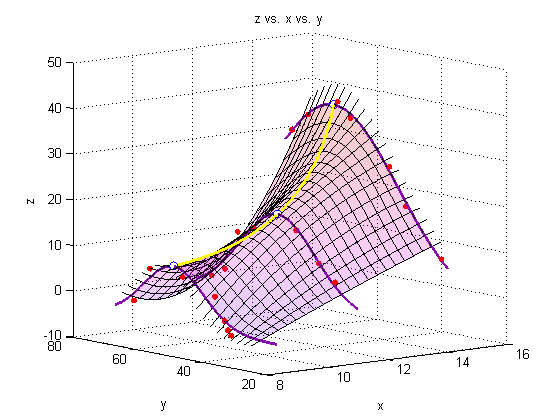 The peaks are asymmetric, decaying gaussian functions. to get two peaks, we simply add two peaks together. the fit is not very good. now we use nonlinear fitting to get the parameters that best fit our data, and plot the fit on the graph. the fits are not perfect. The small peak is pretty good, but there is an unphysical tail on the larger peak, and a small mismatch at the peak. There is not much to do about that, it means the model peak we are using is not a good model for the peak. We will still integrate the areas though. 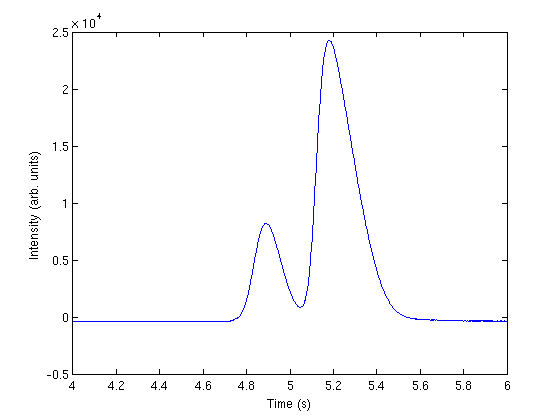 This sample was air, and the first peak is oxygen, and the second peak is nitrogen. we come pretty close to the actual composition of air, although it is low on the oxygen content. To do better, one would have to use a calibration curve. In order to generate plots with a consistent and hopefully attractive color scheme, we will generate these color presets. 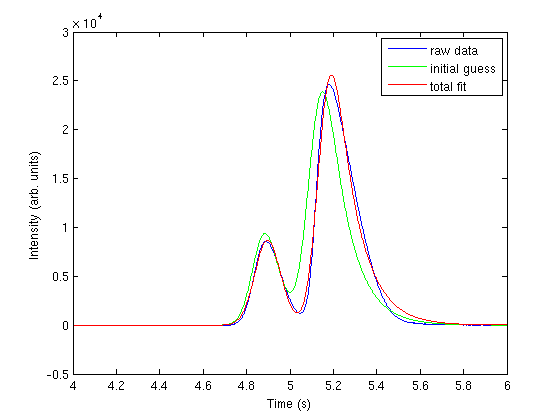 Matlab normalizes colors to [R G B] arrays with values between 0 and 1. Since it is easier to find RGB values from 0 to 255, however, we will simply normalize them ourselves. A good colorpicker is http://www.colorpicker.com. 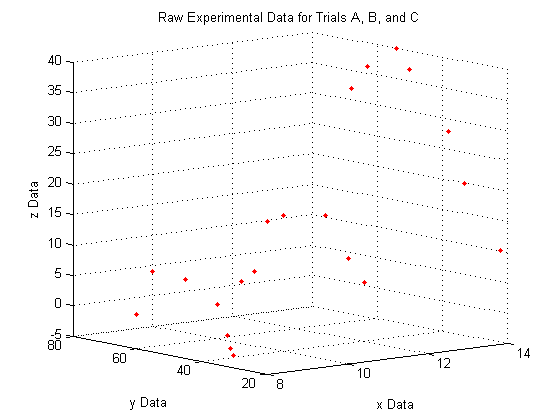 This is raw data from an experiment for three trials (a and b and c). The X and Y are independent variables, and we measured Z. 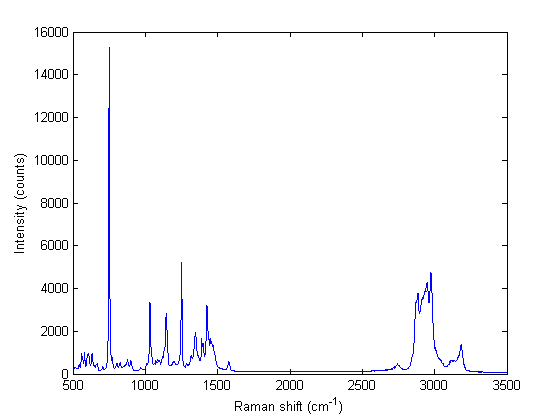 As you can see, the raw data does not look like very much, and it is pretty hard to interperet what it could mean. We do see, however, that since X_a is all of one value, X_b is all of another value, and X_c is all of a third, that the data lies entirely on three separate planes. % try to plot on this figure as well. lets you view a 3D plot from the same viewpoint each time you run the code. To determine the best viewpoint to use, use the click the 'Rotate 3D' icon in the figure toolbar (it looks like a box with a counterclockwise arrow around it), and drag your plot around to view it from different angles. You will notice the text "Az: ## El: ##" appear in the lower left corner of the figure window. This stands for Azimuth and Elevation which represent a point in spherical coordinates from which to view the plot (the radius is fixed by the axes sizes). The command used here will always display the plot from azimuth = -39, and elevation = 10. For every point along the fit-line for dataset A, connect it to the corresponding point along the fit-line for dataset B using a straight line. This linear interpolation is done automatically by the surf command. If more datasets were available, we could use a nonlinear fit to produce a more accurate surface plot, but for now, we will assume that the experiment is well-behaved, and that 11 and 8.3 are close enough together that we can use linear interpolation between them. We must minimize the negative of each of our initial three fits to find the maximum of the fit. Matlab offers a lot of capability to analyze and present data in 3-dimensions. Class A had 30 students who received an average test score of 78, with standard deviation of 10. Class B had 25 students an average test score of 85, with a standard deviation of 15. We want to know if the difference in these averages is statistically relevant. Note that we only have estimates of the true average and standard deviation for each class, and there is uncertainty in those estimates. As a result, we are unsure if the averages are really different. It could have just been luck that a few students in class B did better. the true averages are the same. We need to perform a two-sample t-test of the hypothesis that (this is often called the null hypothesis). we use a two-tailed test because we do not care if the difference is positive or negative, either way means the averages are not the same. this is the standard error of the difference between the two averages. Note the standard error of the difference is less than the standard error of the individual averages. see the discussion at http://stattrek.com/Help/Glossary.aspx?Target=Two-sample%20t-test for a more complex definition of degrees of freedom. 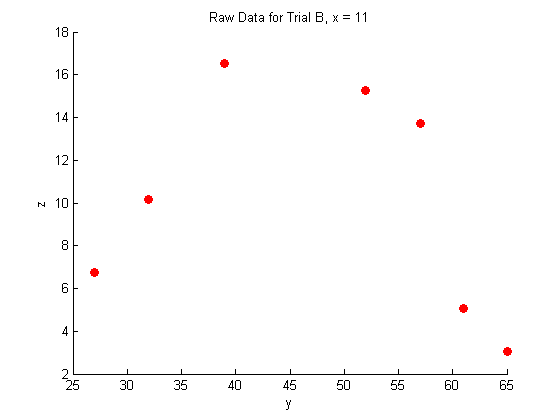 Here we simply subtract one from each sample size to account for the estimation of the average of each sample. 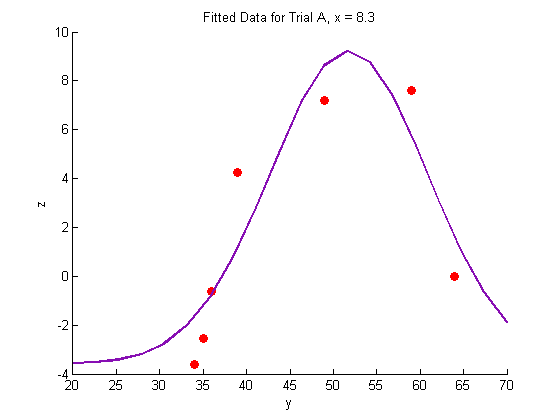 The difference between two averages determined from small sample numbers follows the t-distribution. 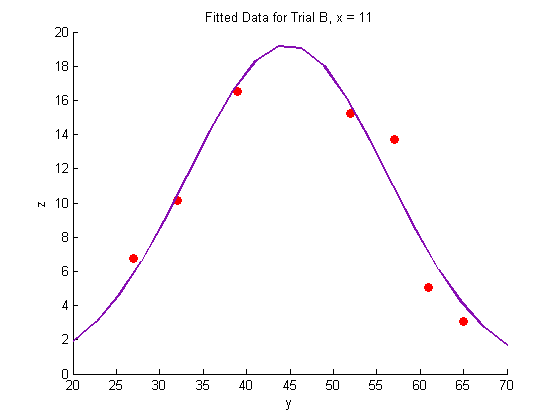 the t-score is the difference between the difference of the means and the hypothesized difference of the means, normalized by the standard error. we compute the absolute value of the t-score to make sure it is positive for convenience later. 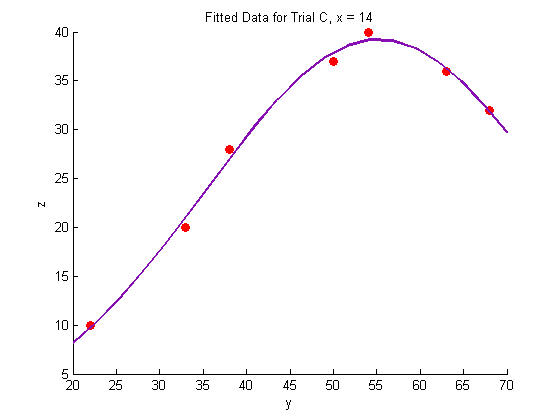 A way to approach determinining if the difference is significant or not is to ask, does our computed average fall within a confidence range of the hypothesized value (zero)? If it does, then we can attribute the difference to statistical variations at that confidence level. If it does not, we can say that statistical variations do not account for the difference at that confidence level, and hence the averages must be different. 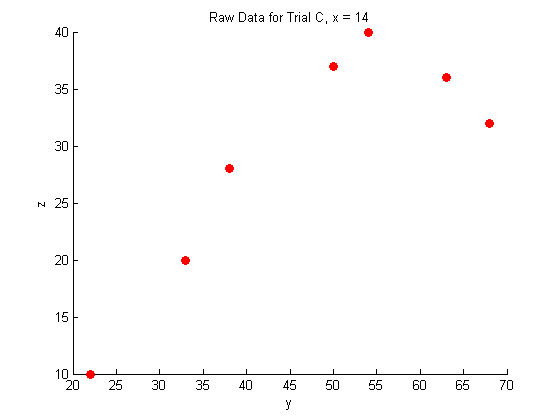 Lets compute the t-value that corresponds to a 95% confidence level for a mean of zero with the degrees of freedom computed earlier. This means that 95% of the t-scores we expect to get will fall within t95. since tscore < t95, we conclude that at the 95% confidence level we cannot say these averages are statistically different because our computed t-score falls in the expected range of deviations. Note that our t-score is very close to the 95% limit. Let's consider a smaller confidence interval. at the 94% confidence level, however, tscore > t94, which means we can say with 94% confidence that the two averages are different; class B performed better than class A did. Alternatively, there is only about a 6% chance we are wrong about that statement. 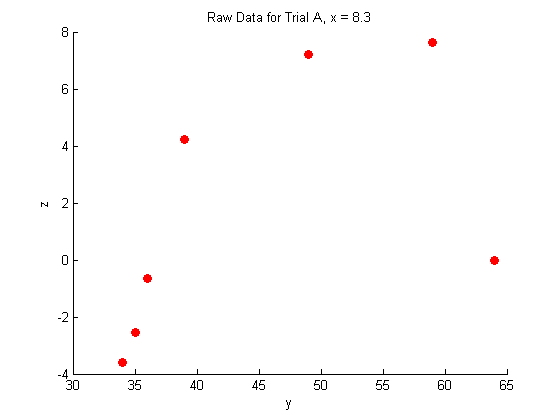 An alternative way to get the confidence that the averages are different is to directly compute it from the cumulative t-distribution function. We compute the difference between all the t-values less than tscore and the t-values less than -tscore, which is the fraction of measurements that are between them. You can see here that we are practically 95% sure that the averages are different. Matlab is pretty good, but it doesn't do everything, and you might not always have the toolbox that contains the function you want. There might even be an excellent open-source software library that can't be included in Matlab, but can be used within Matlab. Matlab has excellent support for using Java with minimal effort. A repository of numerical libraries can be found at http://math.nist.gov/javanumerics/. In this example we install the commons-math Java library, and show an example of using it. Many of them duplicate features in Matlab, but they may implement different algorithms, or more convenient syntax. These two commands only need to be run once, so comment them out after you run them. We have to add the jar file to the javaclasspath so we can use it. Note that the regress command is part of the Statistics toolbox, which is great if you have it! We show here how to do it, so we also have something to compare the Java result to. The first thing we do is import the Java library. the * at the end indicates that all classes should be imported. note there is not getInterceptConfidenceInterval method for some reason! It takes more lines of code to get the Java version of linear regression, but you have finer control over what data you get, and what order you get it in. You still have to read the Java documentation to learn the command syntax, and debugging can be somewhat more difficult than straight Matlab. However, the integration of Java into Matlab opens some interesting possibilities to extend Matlab's functionality.